Paleo Carrot Cake Muffins that are also gluten-free, dairy-free, and refined-sugar free making them the perfect grain-free carrot cake muffin! These paleo carrot muffins are perfect for breakfast or snacks. Looking for more grain-free carrot recipes, try my grain-free carrot cake bars! 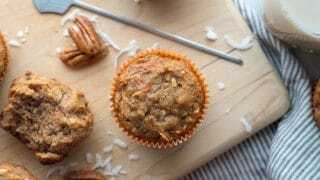 Start your morning off right with easy Paleo Carrot Cake Muffins. They are naturally grain-free and packed with all the flavors of a carrot cake. Shh! And don’t tell anyone that these grain-free carrot muffins they’re healthy. These paleo carrot cake muffins were originally posted on my blog November of 2014. They were previously titled “Carrot Travel Muffins” because we’d make them every time we traveled. 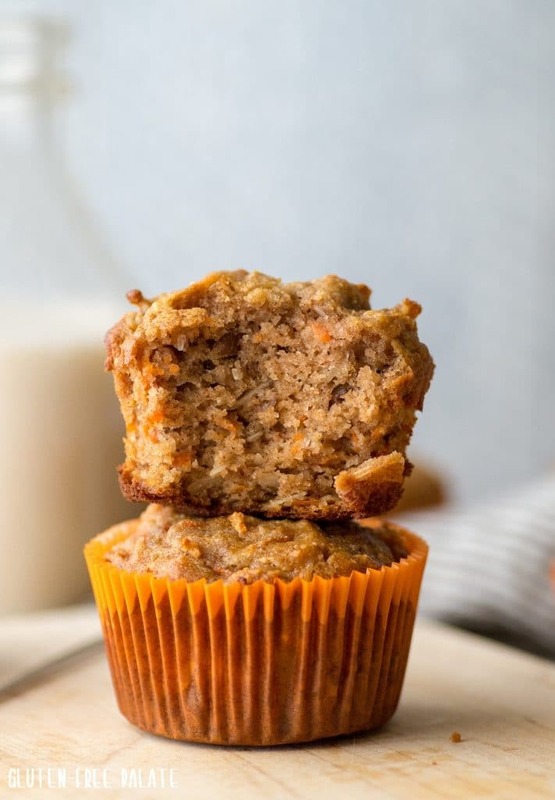 This paleo carrot muffin recipe is simple and a quick grain-free muffin recipe that is also nutritious and holds up well while traveling. I’ve recently given the photos a refresh, to better display how wonderful these paleo carrot muffins are. The previous photo didn’t really do this marvelous grain-free carrot muffin recipe justice. Do you need ideas for a quick gluten-free grain-free breakfast in the morning? Are you traveling soon? 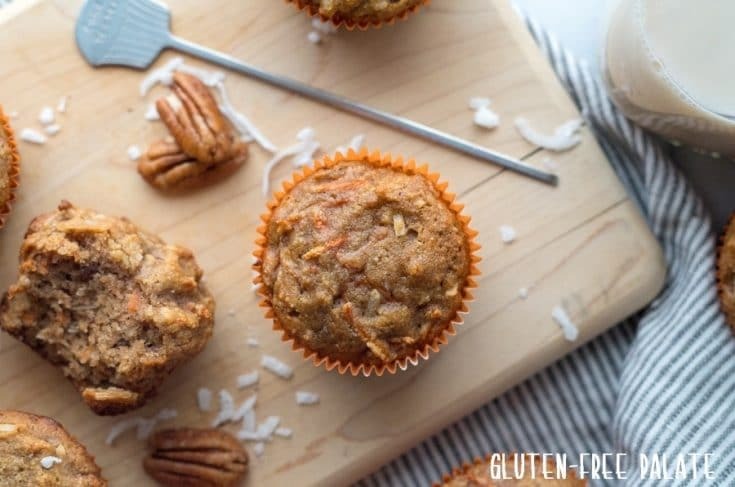 These paleo carrot cake muffins are perfect for both! They can be made in large batches and frozen for a quick breakfast. I usually bake up several batches of these when I know we will be on the road or traveling to visit with relatives. They are are big hit everywhere we go – so we always make sure we have enough to share. We are planning a big two week camping road trip this summer and I plan to have at least a weeks worth of paleo carrot muffins with us when we leave. Yes! You can freeze these paleo carrot muffins. When I make them in batches I freeze them in an airtight container. They will last up to 3 months in the freezer. Bring them to room temperature before serving. I haven’t tried using an egg replacer in this muffin recipe because of the amount of eggs that it calls for. I have had others comment on similar recipes that chia egg and flax egg worked well, but they didn’t rise as much. 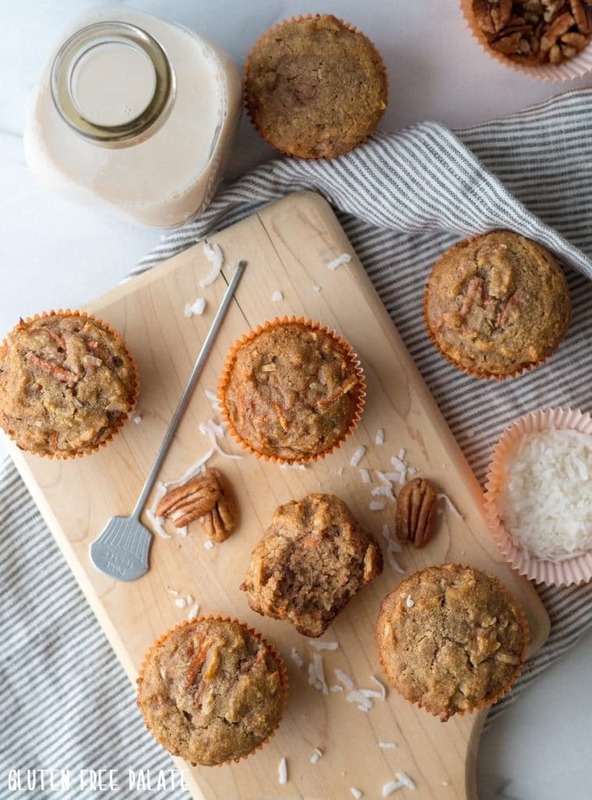 My girls used to hate almond flour muffins, but these paleo carrot cake muffins won them over. I love making these paleo muffins because they enable me to sneak extra vegetables into my girls breakfast without them knowing it. Both girls think these grain-free carrot cake muffins are basically cupcakes with out the frosting. Who am I to tell them any different. These Paleo Carrot Muffins are made with almond flour can be customized, depending on the add-in’s you choose. My girls like them with only carrots. I like to add in dried coconut and chopped nuts for a heartier muffin. If you store almond flour in the Freezer, make sure to bring it to room temperature before you bake with it otherwise it will absorb too much moisture from the wet ingredients. Spoon your almond flour into your measuring cup, don’t scoop. Almond flour is not a 1-t0-1 for regular gluten-free flour or coconut flour. Every once in a while I’ll forget to bring the almond flour to room temperature before I need it. Don’t make that mistake, trust me. It absorbs too much liquid. What can I use instead of honey in these paleo muffins? You can use maple syrup, agave or a sugar free syrup in this recipe in place of the honey. Just note that the flavor will be different. Honey tends to be stronger flavor while adding a touch of sweetness. Preheat oven. Line a cupcake pan with 10 paper liners; set aside. In a large mixing bowl, whisk almond flour, salt, baking soda, cinnamon, and nutmeg. Add eggs, oil, and honey. Stir in the shredded carrots. If desired, stir in optional ingredients. Pour batter (about 1/4 cup) into your 10 paper liners . Bake for 20-22 minutes or until the center is set. For the full recipe and detailed steps, see the recipe below. These grain-free carrot cake muffins are super easy to make. You can have them baking in the oven in less than 10 minutes. 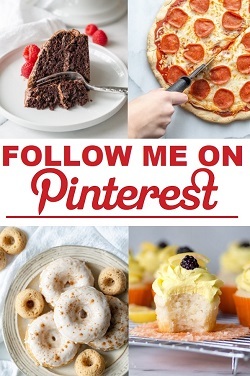 Looking for more paleo muffins? Try my Paleo Blueberry Muffins. Bakerita has a super yummy Paleo Banana Nut Muffin you might like. Paleo Carrot Cake Muffins that are also gluten-free, dairy-free, and refined-sugar free making them the perfect grain-free carrot cake muffin! You are going to love how easy these paleo carrot muffins are to make. Preheat oven to 350°F (180°C). Line a cupcake pan with 10 paper liners; set aside. Pour batter (about 1/4 cup) into your 10 paper liners . Bake for 20-22 minutes or until the center is set. Remove from the oven and cool completely before serving. Store in an airtight container in the refrigerator or the freezer. Working with almond flour: spoon almond flour into the measuring cup and level it. Make sure almond flour is at room temperature before using. Honey substitute: you can use maple syrup, agave, or a sugar free syrup in place of the honey in this recipe. So glad you liked them! Thank you for stopping back by and letting me know. What if I wanted to make this into a loaf instead of muffins? Do you know what the temp and time would change to? I haven’t tried it in a loaf, myself. But if you want to make them into bars you can bake at 350, pour the batter into an 8X8 pan and bake for 25-27 minutes. These brown easily, so I’m not sure how they would do in a loaf pan since they have to bake longer. If I didn’t have coconut oil, what could I use in place of? You can use your oil of choice. Avocado oil and canola oil both work well too. I made these yesterday and they came out awesome! 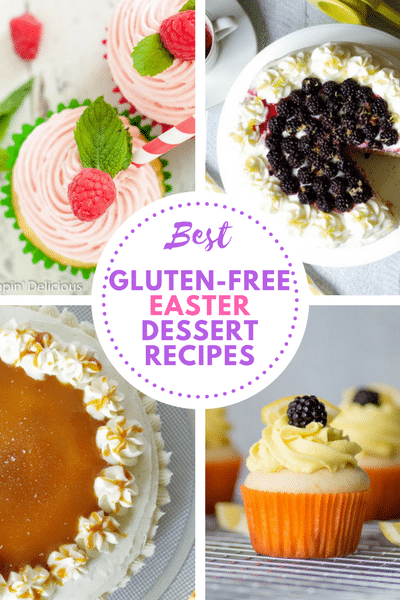 I had my husband try it…he is not GF and is always skeptical of anything I bake that is Paleo…he said they were Amazing! And I have to agree. I added about a tablespoon more of raw honey to make it a little sweeter, pecans and coconut as you mentioned for the optional items and it worked perfectly. Thank you for this wonderful recipe. Will definitely be making it again and again. I’m so glad you liked them! 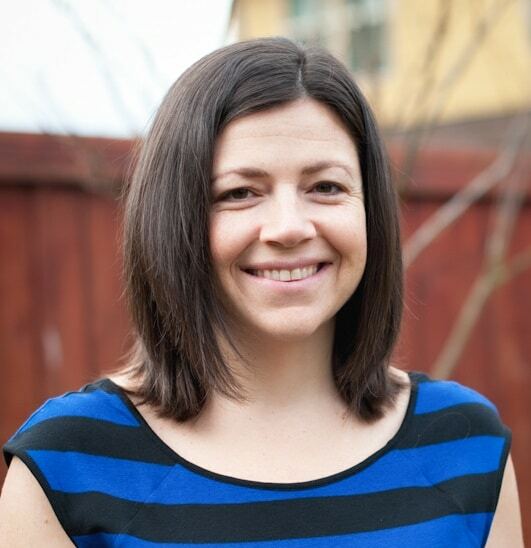 Thank you for taking the time to stop by and let me know. I’ve made these twice in the past week. The texture is perfect and the sweetness is just right. I used maple syrup the first time and honey this last time. Both were so good. This recipe is a keeper for sure! Thanks for sharing! I am so glad you like them! Thank you for stopping by and leaving a review.